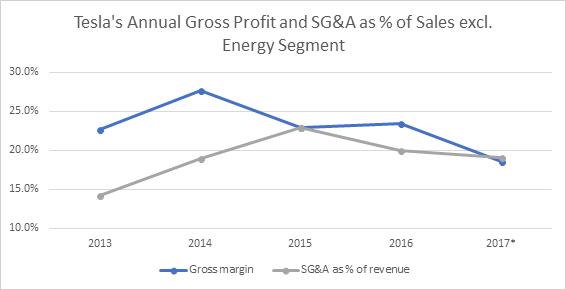 Graph 1: Teslas annual gross profit and SG&A expenses as percent of revenue, excluding Energy segment. Source: company filings, authors calculations, *excluding estimated Energy segment SG&A spending of $M450 (40% of revenue). Teslas (TSLA) SG&A position is one of the most important for the companys profitability. While bears point to the apparent lack of economies of scale in the cost position (e.g. here), bulls keep implying that they are just around the corner (e.g. here), although neither side really explains the underlying economics. But by considering the impact of Teslas direct sales model we can estimate its medium-/long-term SG&A expenses relative to competitors and hence indirectly its possible economies of scale. Through its store network, Tesla can sell its cars directly to the customer at retail prices. Without them, it would have to sell its cars at a discount to dealerships. The average luxury dealership in the US had a c5% GM in 16/17. => Teslas gross margin would decline by c5pp. In return, SG&A expenses will decline because dealers would take on many of the functions. SG&A was c10% of revenue for the average US luxury dealership in 16/17. => Teslas SG&A would decline c10pp. Both reference points are taken from the National Automobile Dealers Associations (NADA) average US luxury dealership profile (here). The disparity between 5% GM and 10% SG&A comes from the fact that dealers make losses on car sales but make up for these with after-sales service. Since Tesla plans for service to only break-even (here) but still has to pay for the associated SG&A, the result is a net loss. These estimations are crude and there are significant differences between traditional dealerships and Tesla stores/service centers which we will get to. But fundamentally, we can see that Teslas direct sales model is a trade-off improving its GM by taking on additional SG&A expenses. I am not criticizing the model. It may turn out to be a good investment resulting in a price premium, higher customer loyalty, etc. But we shouldnt lose sight of the resulting costs. For example (here), in its 2015 initiation of coverage, Jefferies gave Tesla a gross margin premium of 7pp over competitors due to its sales model (p.17f) but expected SG&A to drop to industry standard (p.22). Tesla cant have it both ways. And although not as obvious, the same inconsistency seems often implied in more recent high operating margin assumptions. 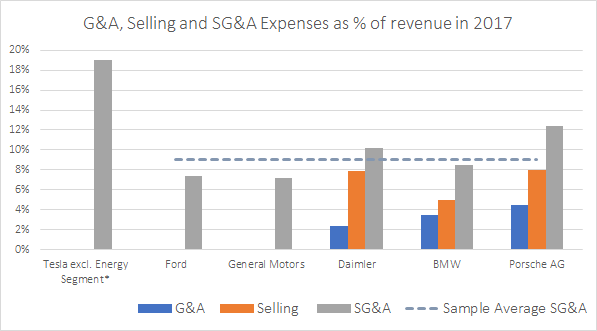 Graph 3: 2017 G&A, Selling, SG&A Expenses as % of revenue for selected automotive manufacturers; Sample average SG&A expenses as % of revenue. Source: Company filings, *authors estimate excluding estimated Energy segment SG&A spending of $M450 (40% of revenue). Synergies. There are lots of synergies – for example, redundant communication, shipments, franchise control and general & administrative costs that can be cut or be centralized. Efficiency. The stores are in more expensive high traffic areas but also much smaller, dont need to carry inventory and need less staff. Price premium. Company-owned store network is to ensure higher and more consistent service quality which allows Tesla to charge a price premium compared to competitors which should reduce COGS and SG&A as a % of sales. Online sales. Tesla customers order cars online that they havent test-driven or even seen in person. Although I dont think the current level is sustainable, this reduces the need for physical stores. The previous argumentation already assumes that SG&A is largely dependent on sales. However, some people argue that Tesla has now finished its fixed cost ramp-up and can start scaling its operating margin. The underlying idea of fixed cost degression (one type of economies of scale) means that the average cost per unit decreases with an increase in output because fixed costs are spread over more units. The hallmarks of potential economies of scale are hence high fixed costs that can support large production increases. But a store network doesnt really fit that bill. Each sales person can only sell so many cars per day and each store can only serve a certain amount of people and area. The same is true for service SG&A which will depend on cumulative sales/the number of Teslas on the street. So, they arent exactly variable costs, but in the long run, there will be a linear-like relationship between revenue and the cost for the store and service network (stepped fixed costs). Maybe this seems obvious, but it drastically reduces the possibilities for economies of scale. 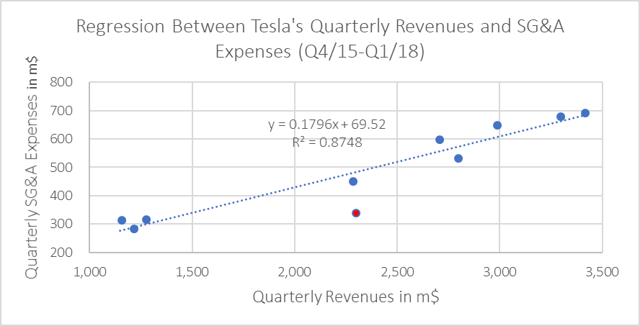 Graph 4: Linear regression between Teslas quarterly revenues and SG&A expenses. Source: company filings, authors calculations. Dont trust a statistic you havent rigged yourself and this one certainly has some shortcomings. Foremost such regressions only really work when all fixed costs are in place. Because Tesla is still in a ramp-up phase this will automatically overestimate variable and underestimate fixed costs. Although besides one outlier (Q3/16), it consistently shows SG&A converging toward 18% of revenue. Given that this is partially due to fixed costs increases, it doesnt seem too far off from the estimated 13-15% medium-term range. I would guess that in the next quarters SG&A will drop significantly as a % of revenue because even a mediocre model 3 ramp-up means revenues are going to increase dramatically causing SG&A to lag. It takes time to hire new personnel and build new stores. Additionally, Tesla will likely try to delay these expenses further in their effort to become profitable. The question will be whether this is sustainable. 3.2. What operating margin do you expect? Given the above reasoning, how do investors derive operating margins above 10%? If Tesla reaches a 25% GM with the industry average R&D spend of 5% of revenue, its SG&A would need to fall below 10%, i.e. barely above industry average while operating its own stores and service centers. This entry was posted in Stocks on May 16, 2018 by admin.